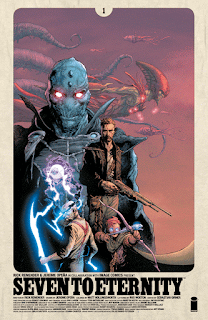 The Fellowship was fortunate enough to obtain a copy of SEVEN TO ETERNITY #1 from Image Comics. Rick Remender writes, Jerome Opeña draws, Matt Hollingsworth colors, and Rus Wooton letters. Adam has lived his whole life as an outcast, because of a choice his father made. It’s been hard, but it’s been a good life. Now the past has caught up with the family – father dead, farm destroyed, just waiting for the wrath of the Mud King. Adam is sick also, and won’t live much longer. So he rides to confront the Mud King, and save his family from his unholy wrath. This story contains much talk of honor – the honor in Dad’s choice, Adam honor in trying to protect the family. It’s an age-old tale, of one who must fight one more time for the sake of others and for himself. It dances between Western and fantasy, and it does so very nimbly, with flavors of Vance and Leiber to season the mix. The art also blends the genres, giving us the beauty of the strange and unearthly and the cold reality of the unwinnable fight. This first issue sets us up for a classic, titanic struggle for an ideal that might not even exist anymore. And it does it in a way that can’t be ignored. This book is going to be a keeper. SEVEN TO ETERNITY #1 is available now at your FLCS or at imagecomics.com.